Tired of traffic jams, numbed by urban life and yearning for a change? 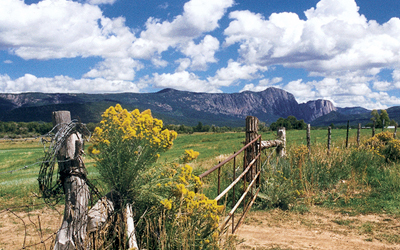 Come to the Chama Valley and enjoy true, small town living, away from the hustle and bustle. The Chama Valley is the west's best kept secret and offers unspoiled scenery in the beautiful Northern New Mexico Rocky Mountains bordering Southern Colorado. Annual events include Chama Chili Ski Classic on President's Day weekend, Snowball Balloon Rally in February, Chama Valley Music Festival in July and Chama Days Celebration in August. You can also enjoy fishing, camping and cowboy poetry at one of the area lodges or ranches or ride the Cumbres and Toltec Scenic Railroad between Antonito and Chama. Wouldn't it be wonderful if you could capture a small piece of "Chama Time" and put it in your pocket to remind you, when you are entangled in traffic, that there is a place where it is not important to be anywhere except where you are? We place the interests of our customers and clients ahead of our own and take time to find that special property for our customers and to get our clients' property SOLD! Come on by and let us help you.